A panorama of Morro Bay created with a four photo composite. From left to right: the south end of the Morro Bay waterfront; the faint hills in the background are Los Osos and the Montana De Oro State Park; the strip of sand across the center is the huge sand spit which shelters Morro Bay from the open sea; at right, the 700 foot high Morro Rock, a volcanic plug; at far right, Australia's visiting Endeavor, a replica of its famed 18th century namesake. During our recent visit, the Australian ship, Endeavor, had just docked at Morro Bay for a week of public display. The ship is said to be an exact duplicate of the famed 18th century British man of war, H.M.S. Endeavor, with which the renowned explorer, Captain Cook, circumnavigated the globe, making voyages of discovery in the South Seas of the Pacific. 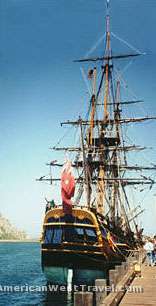 Under the aegis of the National Geographic Society, Endeavor has replicated Captain Cook's journeys, and was on a tour of the west coast of the United States (Summer, 1999). We are told the crew handles the ship in about the same way as the original, and that the main difference is today's crew eats quite a bit better than their 18th century predecessors! The California beaches are often thought of as highly congested places. However there are many outstanding beaches and coastal areas which can be enjoyed with an absence of crowds. The central California coast offers coastal beauty with less commercialism and smaller crowds. 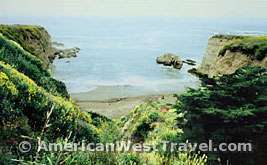 At left is a hidden cove in Montana De Oro State Park, located near San Luis Obispo. The park offers trail access to a very rugged section of coastline with many outstanding views of sheer cliffs, rocky shorelines, and hidden coves. If you come in the spring or early summer you may be treated to some amazing wildflower displays on the bluffs. This is especially true following a rainy winter. There are numerous wide open beaches within a short distance of this state park. These areas offer excellent opportunities for tidal pool exploration and beachcombing. Left, the surf pounds a rocky finger jutting out from the base of a cliff. Right, the bird (foreground) and the surfer (background) seemingly have the beach to themselves at Morro Strand State Beach. 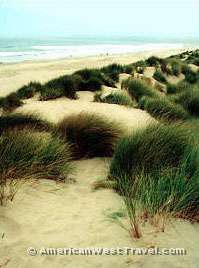 Sand dunes meet the beach at nearby Pismo Beach State Park. Early morning beach combing here will reward you many large and beautiful seashells including clams, sand dollars, and scallops. Intact clam shells as large as 4 to 5 inches across can be found. The Pismo clam was once highly prized for its culinary value and was harvested in tremendous numbers, almost to extinction. The clams are now protected, and clamming is quite limited. However the local restaurants offer a wide variety of great seafood. 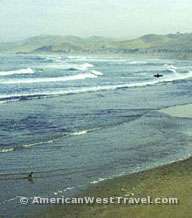 Location: The beaches are off of the Pacific Coast Highway (California Highway 1), north and south of San Luis Obispo.